I am the member of "wasabi experience project"
This project provides Japan's carefully selected superb experiences. Calling all samurai enthusiasts!! Join this 2.5-hour immersive experience packed with samurai action and cultural excitement. Marvel at a fine collection of samurai artifacts including armors and swords while learning about the history of samurai. Master the beautiful art of Bugaku, samurai performing art combining tradition and innovation, with the expert instruction of an award-winning samurai performer. Wield various kinds of weapons with style and finesse, dance elegantly with a fan, and pose for the camera to capture the most instagrammable moments. Simply put, this is a dream experience for all the samurai lovers!! Make your own way to Bugakuza Tokyo Samurai Gallery located in central Tokyo where you will be welcomed with a bowl of Japanese tea by your instructor, who is the inventor of the art of Bugaku, the cultural fusion of Japanese traditional martial arts like Naginata and Iai with performing arts such as Noh theater. He has performed on numerous stages around the world from Florence to Jerusalem to Sao Paulo, and received a number of honors for his exceptional performing skills including ones from the imperial household. Before jumping into samurai action, first get to know the background of Bugaku as well as the history of samurai while browsing through impressive collections of samurai armors, swords, Noh costumes and face masks. Feel free to touch and take photos of these stunning pieces and appreciate the fine details put into them. 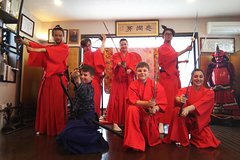 After changing your clothes to our special red training outfit that will sure to get you into the spirit, practice martial arts with weapons of your choice. A wooden bokuto sword, a metal katana sword, or a long naginata spear; whichever fits your personality! Bugaku is a peaceful martial art that values beauty and style. From drawing and sheathing of the katana to a fierce thrust of the naginata, learn how to carry yourself like a true samurai from the Bugaku master. Not only will he teach you the proper form, but also the long-held samurai code of honor, such as respecting your opponent. Then, you can show your delicate side as you perform Noh-inspired dance with a gorgeous fan in your hand. During the session, the instructor will take many photos and videos of you and send them to you via email or social media for you to show them off on instagram, so invoke your inner samurai and bust out the most stylish moves! !